This fire cart is a fantastic addition to our vintage and industrial range of furniture. This authentic fire cart with its original cast iron wheels has a timber frame which we believe to be pitch pine. It would make a fantastic feature in any large kitchen, restaurant or dining area. It comes complete with two original buckets and a fireman's helmet (the helmet we believe to be a new addition). 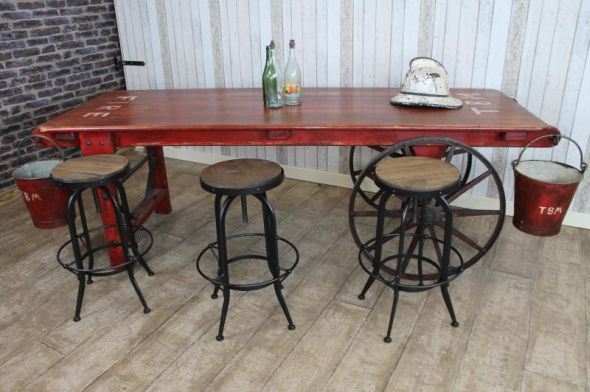 We have pictured this table with a selection of our vintage style swivel stools which are not included in the listing, but can be purchased separately. The height of this table is higher than a standard dining table, and so can be used as a kitchen island. It is in outstanding condition for its age.